Posted in: Media Release, Missing. Tagged: Phillips. 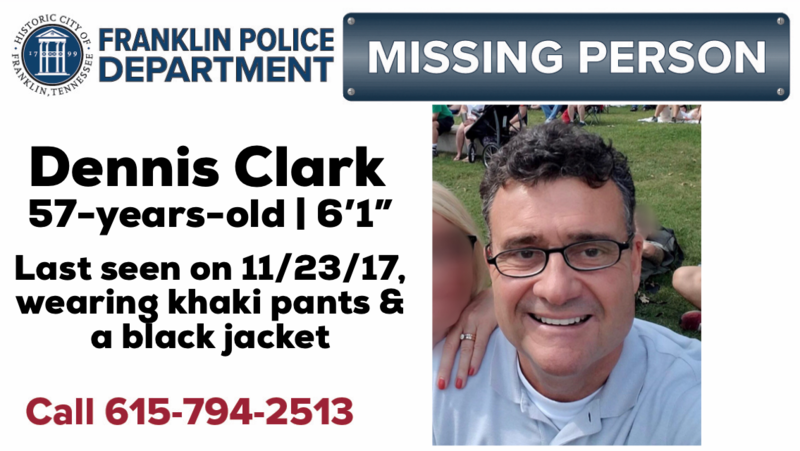 Franklin Police are investigating the disappearance of a man from the Knolls of Cool Springs subdivision. Family members say that 57-year-old Dennis Clark left his Franklin home for a walk at 4:00 pm Thanksgiving Day, and hasn’t been seen or heard from since. Clark’s family grows more concerned with each passing hour, because Clark left without his wallet, keys, or cell phone. Clark does not suffer from Alzheimer’s or dementia. He was last seen wearing a black jacket and khaki pants.